Three UK and Gravity Road launched its first ever interactive 8-Bit video game for Instagram Stories, yesterday. 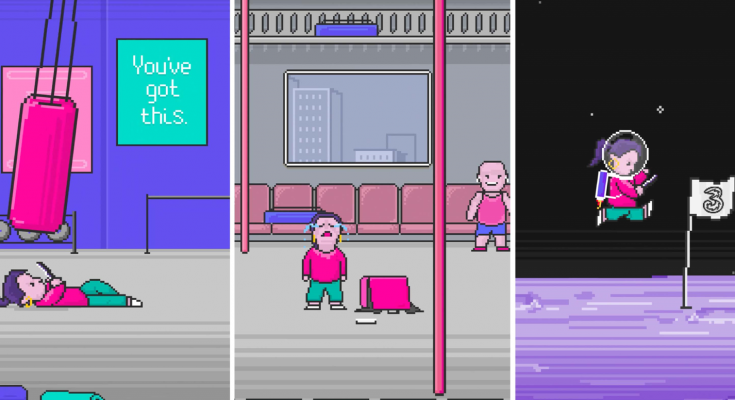 Epitomising Three’s latest brand campaign #PhonesAreGood, the new 8-Bit game celebrates phone culture and features a character whose aim is to make it through three levels of obstacles without looking up from her phone. The game comprises a series of stitched-together stories across three levels of increasing difficulty – a gym, a train and outer space. Each story contains an obstacle, which can be avoided with timely tapping. Failure to tap at the right time results in collision. Once players successfully complete all three levels they get the chance to win a Razer Phone 2, a handset specifically designed for gaming and widely considered one of the best phones on the market for mobile gamers. Drawing on the insight that gaming has moved beyond being an in-home experience and into the mobile world, the Instagram Stories game throws back to the 8-Bit style of games the audience grew up with and feels nostalgic about. A celebration of mobile gaming on today’s ubiquitous platform – Instagram, players can get a quick and fun fix even when swiping through Stories.